for the presentation Crankshaft Design is a software developed to meet the needs of many manufacturers and tuners in the develops and optimization of the crankshaft. This software is of essential help to identify the best solutions of balance and inertia for each specific engine and every specific need, in order to optimize performance, driveability and reliability. The crankshaft as well as a structural point of view must also be studied for two fundamental aspects, the balancing of the forces generated by the movement of the reciprocating masses (piston, piston rings, piston pin and small end of the connecting rod) and those rotating (big end of the connecting rod, the crank pin), and also by the inertia that the crankshaft is able to offer. 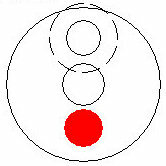 In a single-cylinder engine, unless you introduce counter-rotating shafts, balancing can be only partial, and how to choose this partial balancing has always been the subject of discussion on what might be the best, in fact there isn't a better solution in absolute, but the optimum should be chosen according to the characteristics of the engine and of the vehicle for which the engine is employed. Same goes for what concerns the crankshaft inertia, lighter, heavier, holes, no holes, are questions that recur over time, at which isn't possible to give an answer because also for this aspect the best solution depends on the characteristics of the engine and its use. In view of this, in practice, it makek the initial choices and then on the basis of tests and repeated attempts are made any changes, this process is long and laborious and often do not know if the solution found is really the best. 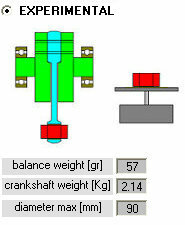 The software Crankshaft Balance Design may appraise in advance the technical effects that the choices of balance and inertia give in terms of performance and reliability in relation to the characteristics of the engine and of the vehicle on which it is applied, allowing you to quickly find the optimal solution. The software is structured in four sections that allow to analyze, to calculate, and to develop, the crankshaft in the best way. CRANKSHAFT ANALYSIS In this section the software calculates the main features of the crankshaft that you've, or that you want develop, in fact calculates quickly WEIGHT - BALANCE - INERTIA of the crankshaft. 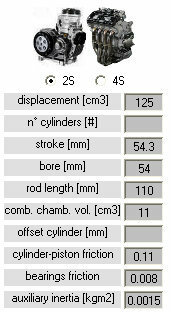 CRANKSHAFT DESIGN In this section the software calculates DIMENSION and POSITION of the COUNTERWEIGHTS, or of eventuals HOLES, to have a determined crankshaft balance, showing in the meantime how are modified inertia and weight. 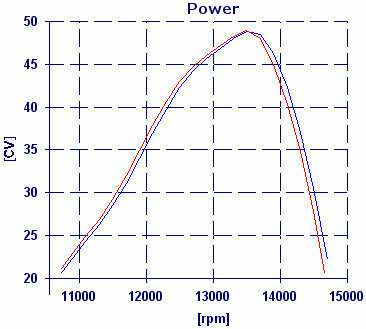 ENGINE PERFORMANCE CALCULATION In this section the software calculates how changes the POWER CURVE of the engine in function of the choices of BALANCE and INERTIA that you've made on the crankshaft. 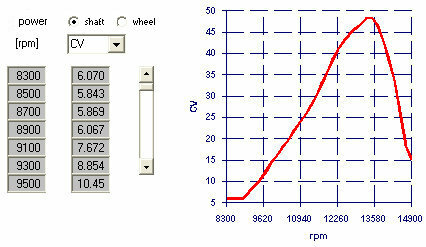 VEHICLE PERFORMANCE CALCULATION This section avalaible in the version PRO of the software allows to calculate the VEHICLE PERFORMANCE keeping in account how the features of the crankshaft influence the engine power, and the behavior in the gear shift phase. 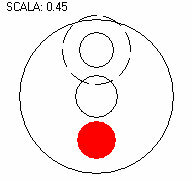 Below we will show in detail how the software works in the different areas. 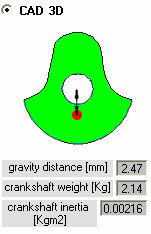 The software allows to calculate the main features of the crankshaft in a simple manner. 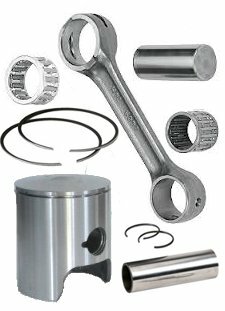 In fact is sufficient to enter the informations of the slider crank (stroke, and weights of the parts), and some data that allow to define the crankshaft. In this regard the software offers different data entry opportunities to meet all the needs. If you've made the classic experimental test to calculate the balance, you can enter in the software the value of the weight balance found, and the software in function of the slider crank weights will calculate quickly the BALANCE of your crankshaft. Moreover if you measure the WEIGHT and the maximum diameter of the crankshaft, the software will calculate an estimate of the INERTIA of the crankshaft itself. If you've the three-dimensional drawing of the crankshaft, from your CAD 3D you can easily take over the gravity position, and the WEIGHT of the crankshaft, thanks at these data the software will calculate quickly the BALANCE of your crankshaft in function of the slider crank weights. If instead your crankshaft has a classic full circle shape, or you want develop a crankshaft of this type, the software thanks the main dimensions will calculate automatically WEIGHT, BALANCE and INERTIA of your crankshaft. 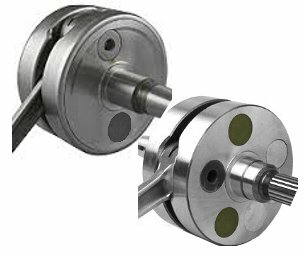 If in the crankshaft are already presents counterweights, or holes, in the software is possible easily to enter their characteristics in order to take into account in the calculations and to see how they affect WEIGHT, BALANCE and INERTIA. 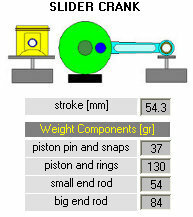 After to have entered the crankshaft data in the modality that you prefer, and the features of the slider crank, the software Crankshaft Design calculates WEIGHT, BALANCE, and INERTIA of the crankshaft, both taking into account of the counterweights and of the holes, both excluding them, in this way it will be easy to understand too the characteristics of the initial geometry of the crankshaft, and to evaluate the possibility of modifications. In addition to the calculations, the software draws the geometry of the crankshaft that you entered, allowing you to assess whether the data is correct and where there is space for any modifications improvements. If you want modify an existent crankshaft, or you want study a new crankshaft, after the analysis phase which allows to have a complete picture of the situation, the software Crankshaft Design allows to study easily the interventions to be carried out on the crankshaft to obtain BALANCE and INERTIA that you want. The software allows in fact to calculate automatically position and characteristics of the counterweights that are necessary to achieve a determined balance. For first you must choose the percentage of balance that you want obtain. In addition you can indicate the number of counterweights that you want use, the thickness of the counterweight, and the material (density) Finally you can choose if the position of the counterweights must generate the minimum, or the maximum, inertia. 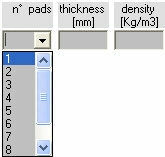 This section of the software Crankshaft Design can be used both to calculate the counterweights of a crankshaft that has never been balanced. 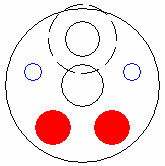 Both to modify the balance of a crankshaft which has a different balance from what we want. 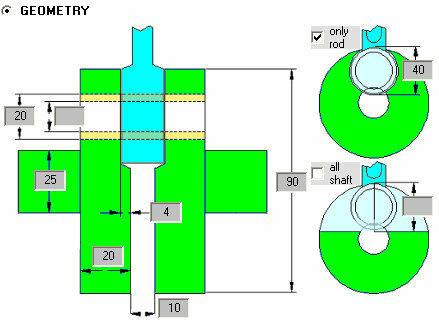 If for example you've already a crankshaft with a balance of 50% and you want to go at a balance of 40%, the software will calculate dimensions and position of the hole to make on the crankshaft, if instead you want increase the percentage of balance, the software will indicate you, position and characteristics of the additional counterweight to use. The software allows also to see the balance and the inertia that you obtain using determined counterweights, or making specifics holes. Shows you the drawing in scale and how change WEIGHT, BALANCE, and INERTIA with the new counterweights and holes applied. The choices of BALANCE and INERTIA in addition to affect the forces and the vibrations that you've on the chassis, affect the engine performance. 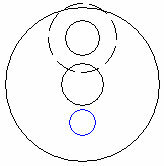 In fact in function of the BALANCE that you choose change the forces acting between piston and cylinder, and on main and crankpin bearings, and therefore on the mechanical friction losses, while the INERTIA affects the crankshaft speed during the engine cycle, and therefore modifies the fluid dynamic behavior of the engine, and the relative efficiency. The software Crankshaft Design is able to calculate the MECHANICAL LOSSES in function of the choices of BALANCE that you make, and to see how changes the ENGINE POWER CURVE in function of the crankshaft INERTIA. 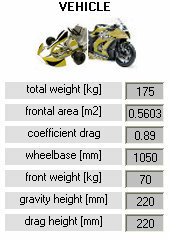 In the software you must enter the main technical data of the engine, and the power curve detected at the dynotest. 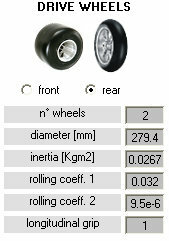 At this point entering the balance percentage, and the crankshaft inertia (you can use also the values calculated in the phases of ANALYSIS, or of DESIGN), the software will calculate how change the power curve, the power lost for mechanical friction, and the forces acting on the chassis. 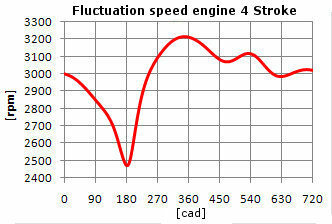 In addition to the global data it also shows the graphs of all the quantities calculated as a function of the engine speed. This section of the software Crankshaft Design is fundmental to improve the engine performance in the direction that you want acting on the crankshaft. In fact the software allows to compare the differents solutions, and therefore to find immediately, that optimal for your needs. Thanks to the software Crankshaft Design you can therefore study the interventions to make on the crankshaft as balcance, and as inertia, to model the power curve for your needs. You can then work to shift the maximum power peak, or to have more extension, or to play with inertia to soften the torque curve, etc., identifying the optimal solutions quickly and accurately. Moreover you can always to evaluate how change the forces on the chassis in function of the choices that you make, managing therefore also eventuals problems related to the vibrations. 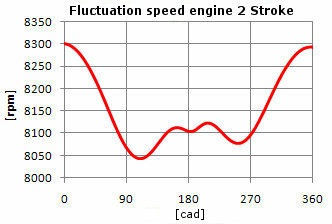 In the version PRO of the software Crankshaft Design is possible to see also how the choices of BALANCE and INERTIA affect the vehicle performance. to use all the available power. In the software you can also indicate at which engine speed you want make the upshift gear, so is possible to evaluate the vehicle behavior in the real operation that you want perform. 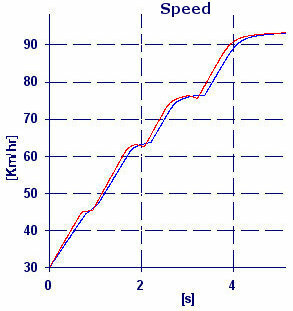 and also see the time needed to reach the different speeds, and the speeds that are reached in the various gears, with the relative time to reach them. As you've seen, thanks to the software Crankshaft Design, to develop, and to improve, your crankshaft, becomes really easy, and you can really increase the performance of your engine, and of your vehicle, acting also on the crankshaft in the direction of your needs! Besides are summarized the functionality of the two versions of the software.